I worked this weekend, like I work most weekends. I can’t complain because I only work two days a week. Most of the time I like waiting tables, for reasons I’ve talked about plenty here at The Ordinary. Mostly, it’s because, although I’m dubious sometimes about the goodwill of humanity as a whole, I like people, much of the time. Sometimes I feel good about my job, I approach it with great cheerfulness, I want to keep busy and turn lots of tables. Lately I’ve been in a slump. I suppose this happens to everyone, no matter what their job. I’ve been doing it too long. It’s gotten to the point where my heart sinks a little every time the door opens and new customers walk in. It will pass, I know it will, but that’s how I’ve been feeling lately. Yesterday was supposed to be warm and sunny (they promised!) but instead it was spitting grey and cold. Which means we weren’t very busy, and the day passed in a slow sort of blur, and I did my best to be friendly to everybody, but I was feeling a little grey myself. And then around 3:30 the sun came out. The door opened, and my heart didn’t sink at all, because in walked Malcolm, and I thought I’d never seen anything so bright and beautiful. He wore a bright green shirt, and bright green-and-yellow sneakers, and his green eyes were bright. He wore a purple backpack, and it didn’t have anything in it but lemon drops. I was all done taking tables, so we sat outside on a wall in sunshine that felt almost bewildering, after all the rain. The glad trees around us were suddenly vivid, vibrant, spring green. I drank out of a bright green cup, and I had lemons and limes in my water. Malcolm dropped a lemon drop in my cup, so sweet and tart. And we just sat in the sunshine, in a bright green-gold world, not talking at all. It felt like waking up. The secret to this cake is that it has a melted easter bunny on top. We bought Malcolm a white chocolate mint easter bunny, because he doesn’t really like chocolate, but he wasn’t too crazy about this, either. If you don’t happen to have a leftover white chocolate mint easter bunny, you can melt white chocolate and add a drop of peppermint essence. If you like, you could add a drop of peppermint essence to the cake itself as well. In a small saucepan over very low heat, melt the butter and 1 cup chocolate chips, till just melted, stirring from time to time. Remove from heat and cool slightly. Whip the egg whites till stiff in a large bowl. In a food processor, whiz the egg yolks with the sugar and extracts until light and fluffy. Add the flour, salt and baking soda, and whiz till quite smooth. Add the milk and process until completely smooth. Stir a spoonful of egg whites into the batter to lighten it, and then pour the batter into the egg whites, and fold gently until everything is well-mixed. Fold in 1 cup of chocolate chips. Pour into the prepared pan and bake for about 40 minutes until it’s puffed, firm on top, and bounces back when you press lightly. Allow to cool. In a small saucepan over very low heat, melt the butter and white chocolate until just melted, stirring until it’s completely creamy and smooth. Stir in the mint extract. 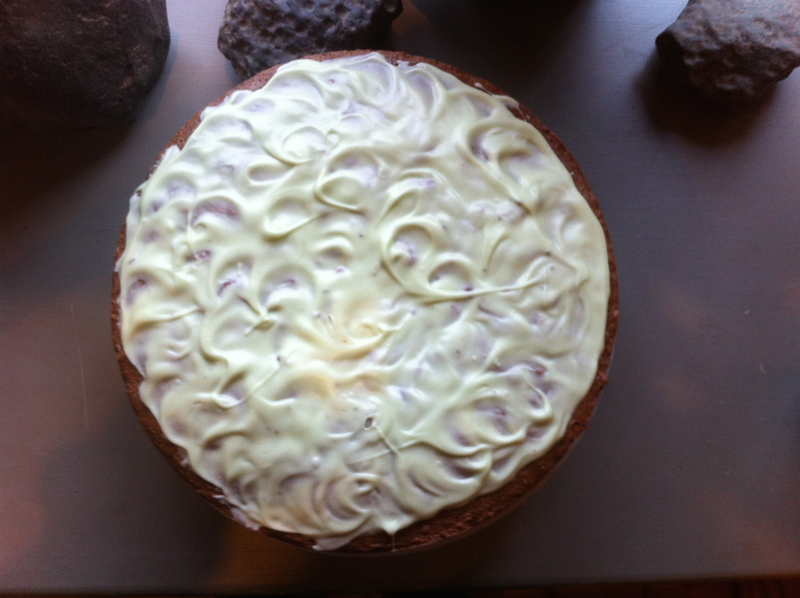 Spoon the chocolate over the cake, and make it into pretty swirls with the back of a spoon. Let cool and set. This entry was posted in cake, chocolate, dessert, recipe and tagged chocolate chocolate chip cake, mint chocolate cake, white chocolate mint ganache by Claire. Bookmark the permalink.